When employees don't use the EAP, it is often for a hidden underlying reason you may not of thought of.... The EA professional forgets that every job, including theirs, is about marketing. EAP skills could be said...to come second. For EAPs (not "faux" EAPs associated with some managed care firms) that are CT-driven, this High Utilization Formula. If you're missing a piece of it, you missing element of synergy -- something that can help your program really "wring the rag" to maximize client utilization. It takes "value added" to a whole new level. Beyond supervisor training and employee orientation: 1) Promote confidentiality continuously to retard attrition of the perception by employees that the program may not be confidential. This is a natural phenomenon caused by fear. It does not go away. Your EAP won't escape it. If you do not market confidentiality via written communications and frequently have it mentioned by key stake holders talking the program, then you will lose the perception that the program is confidential. No EAP is immune from this phenomenon. 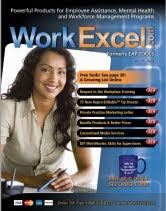 2) The EAP should be a voluntary mention or a formal part (as needed and appropriate) in every "performance improvement plan"
3) The EAP should be part of risk management integration with referrals to help injured employees on Workers' Compensation to get help and address many issues associated with injury and recovery -- many are psychosocial/psycho-organizational. 4) The EAP should grow its influence by making recommendations to management about how to best use its services to reduce behavioral risk exposures. This should be done with a "risk mapping report" annually produced by EAP staff pooling their ideas about unmet and emerging issues associated with behavioral risk in the organization. 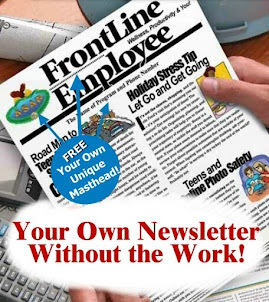 6) There should be a monthly--heavens...not quarterly!--newsletter of 2 pages, never 4, given to employees to educate them about workplace wellness topics, personal wellness, communication, and goal attainment, etc. -- and it should find its way home with employees and include articles that benefit family members, while also promoting the EAP. 8) EAP posters should exist in the organization that are in strategic places and removed and replaced by other posters at least every six weeks just prior to becoming "invisible" to passers-by (again); Don't buy them off the shelf. Use a simply MS Publsher Program to create your own and a color printer. 9) Family members should be seen by EAPs, if needed. 10) Key referral points in the community--courts for arrests, juvenile justice, information and referral agencies, emergency rooms, hospital social work departments, urgent care clinics, etc should all have your EAP's phone number in their rolodex so when employees come to those locations they get referred to the EAP by these external sources (send your newsletter to these program directors so they remember you when the time comes.) This is is about the EAP engaging in follow-up....I will throw in #11. 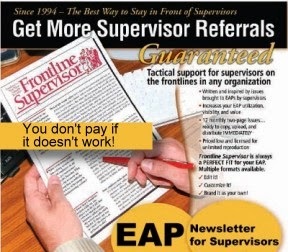 I call it the 11th EAP commandment: Never let management tell you, "But EAPs don't do that." HR professionals have become victims in recent years of the blind leading the blind. Few know what an EAP is really all about. They've been propagandized to and been given false models of EAPs are--models that serve the insurance industry, not employees or the profession. Fight it and you'll fight for your employees and the profession. Maybe someday there will be 8000 members of EAPA, like their used to be.